In response to the International Ideas Competition for the Bering Strait, Lateral Office‘s Mason White and Lola Sheppard (also some of the minds behind the excellent infrastructure blog InfraNet Lab) created a proposal that is part infrastructural response and part ecological. The Bering Strait, for some obvious reasons, is a difficult site to work with logistically, but also represents an interesting temporal and spatial connector between two continents in the east-west direction as well as a marine highway from the north to the south. 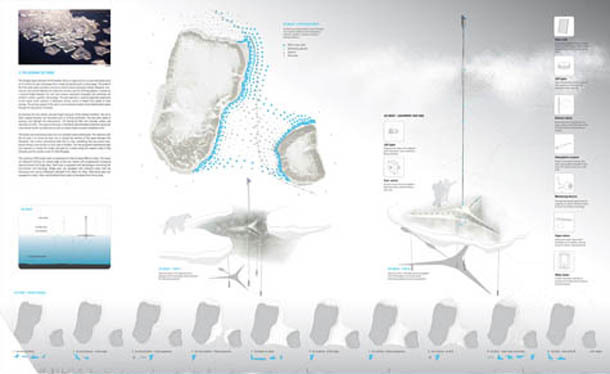 The two components of the proposal – an Ice Park and an occupiable mobility structure – attempts to address these two directional interests. The infrastructural tunnel/bridge element more directly connects the two continents by extending existing railways and other infrastructure, in addition to a UN Headquarters. While I find the second part of the proposal less compelling (though imagining frigid UN members is amusing), the Ice Park with its synthesis of ecological, climactic, and social agenda is a thrilling idea – though it did not win the competition.